All residents will vote on the mayor and the 3 At Large posts. Only residents of each district will vote for the particular district council seats. To determine which district you are in view the city map on our “Related Links” page. If you are a concerned citizen with the skillset that adds value to the community, are willing to put the time and effort in shaping the newly formed city into a model for others to follow, and want prevent the runaway government we are witnessing throughout the land, allow us to help level the playing field. Peachtree Corners Ballot Committee (PCBC) is committed to leveling the playing field. PCBC is an all-volunteer group of concerned citizens in Peachtree Corners, committed to watching over the new city government and ensuring it is something truly unique in government - forever inexpensive and unobtrusive to its citizens. We intend to hold all candidates and eventual city officials to the promises of a City-lite government. Hurry! In order to run for office you must register (qualify) by noon Wed Nov 30!! The Gwinnett County Election's office announced that qualifying dates are all day Monday, Nov. 28 and Tuesday, Nov. 29; and Wednesday, Nov. 30 until 12 noon. The qualifying fee to run is 3% of the desired post's salary. So for Mayor, the cost is $270.00 or 3% of the proposed $9,000 annual salary. For those wishing to run for one of the 6 city council seats, the cost is $240.00. You must go to the Gwinnett Elections Office and pay by check or money order before the deadline. The election will be held in March. The election to create the city was not a mandate. Had 500 of the yes people voted no the city would have been voted down, however it is what it is, and now we must all work together to ensure that the future remains bright. We will not allow for any political machinery to prevail in this election. 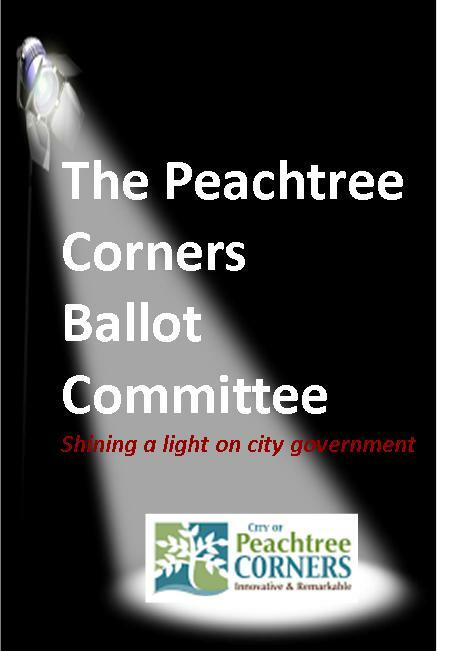 PCBC intends to facilitate to all citizens of Peachtree Corners the facts, and allow them to decide. Our promise is that if you are able and willing we will facilitate the access. How do you envision The City of Peachtree Corners in 20 years? What is the biggest problem we have to solve to get there? What changes in zoning from the current County Codes would you propose? How do you propose to manage and enforce them? What changes in permits and fees from the current County process would you propose? How do you propose to manage and enforce then? What changes in the garbage plan from the current County service would you propose? How do you propose to manage and enforce them? What office space do you think is appropriate for the City government? What do you think is the best use of the land across from the Forum? How many full time employees will the city need to manage city operations, Zoning, Permits, Fees, Enforcement, Fines, etc.? What is your position on taxes? How would you propose the issuance of City Bonds? When would you find it appropriate? How will you incorporate the views of the disparate communities that now make up Peachtree Corners? In particular, the communities that are very skeptical of the value a city government can bring? We invite all candidates for Mayor and City Council positions to respond. Send your responses and a short bio to info@peachtreecornersfacts.com We will publish them here. Want to Run for Office in the New City of Peachtree Corners? The Gwinnett County Election's office announced that qualifying dates are all day Monday, Nov. 28 and Tuesday, Nov. 29. And Wednesday, Nov. 30 until 12 noon. The qualifying fee to run is 3% of the desired post's salary. So for Mayor, the cost is $270.00 or 3% of the proposed $9,000 annual salary. For those wishing to run for one of the 6 city council seats, the cost is $240.00. You must go to the Gwinnett Elections Office and pay by check or money order before the deadline. The election will be held in March. Thank you to those that read the charter and learned about the structure and rules governing the new city of Peachtree Corners. It was a close race, much closer than most predicted. The No-side garnered 44% of the vote. The challenge going forward will be to bring the disparate communities that now live under the Peachtree Corners moniker together as a single city. Whoever becomes the new mayor and city council will need to be cognizant that there is a large population that is skeptical of the value of having a city. To have a truly vibrant and cohesive community, the new leaders will need to work to bring that value without the usual costs, bureaucracy, and other trappings of government many are so disenfranchised with. We wish the community and its future leaders the best in tackling that challenge and making Peachtree Corners a truly different and successful form of government for all the people it serves. The mantra from the Peachtree Corners City proponents is “Government Closest to the People is Best”. This sounds good on the surface, but the opposite is actually true. The closer we are, the less we need government at all. As Thomas Paine argues in “Common Sense”, government is only needed when the community is so large that we can no longer get together neighbor to neighbor and business to business to solve our problems. Our world today is rich with technologies that help us communicate and thus shrink our community. Common sense says why go to the expense and bureaucratic inefficiency of establishing a government close to home? The best government is one that does only what people cannot do for themselves and governs the least. Government is best when it is large enough to do the job with economies of scale and yet close enough to listen to the needs of the people. Clearly, with today’s means of transportation and high-tech communications, access to those in government by the governed is real time. Distance has no impact. Government needs to be large enough to provide economies of scale. Otherwise its costs are higher than the benefit they can provide. Government becomes a liability and a nuisance to the community, crowding out the private sector, the real engine driving prosperity. Peachtree Corners City is too small and its focus to narrow to matter. It only offers power to a few and more trouble than it’s worth to everyone else. Peachtree Corners is a blessing because we are free of excessive government. Vote No on November 8th and keep it that way. There are two items on the Ballot on November 8th. First, the SPLOST. This is a one penny sales tax to support Gwinnett County Schools. The other is the incorporation of Peachtree Corners as a city. 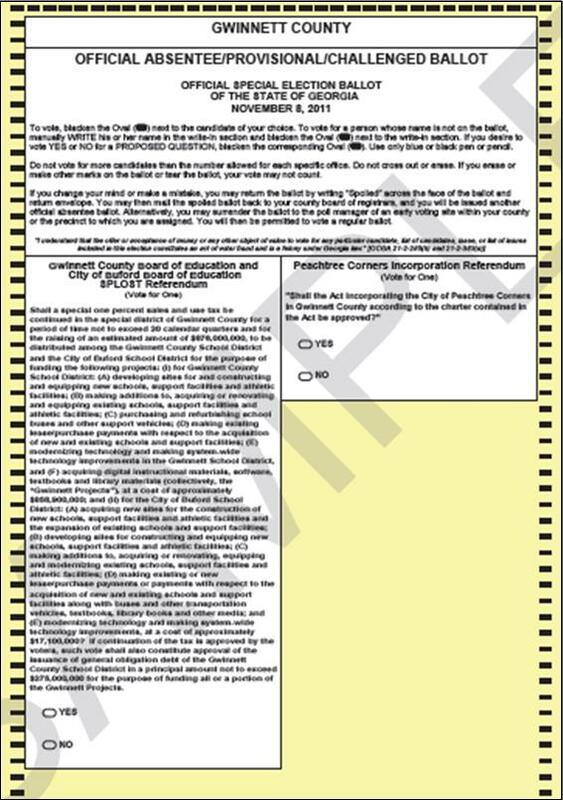 Here is what the ballot is expected to look like. East Point City Council has increased utility cost for residents by $47/mo over objections by the mayor. The mayor has filed a lawsuit against the council for violations of the city charter. Read the full AJC story here. (9) May generally exercise any power granted by this charter or general law, except to the extent that a power is specifically and integrally related to the provision of a governmental service, function, or responsibility not yet provided or carried out by the city. We are particularly alarmed by items 3, 4, 5, 6, and 8 in this list because it provides a means for the transitional group to change the charter, incur debt, and set up all sorts of departments, commissions, etc. that the City will be forced to honor and fund through more taxes, permits fees, and the like. All the while, they may accept gifts and grants for their favor to whomever is providing said gifts. Please read the Charter before you vote. You are not voting on or for the people currently supporting cityhood and their pretty postcards. You are voting on this document. It and the politicians using it are what will ultimately rule us. Close to 200 Johns Creek residents turned out recently in opposition to a zoning request to allow a 268-unit apartment complex in the city's Technology Park area. J.C. Flex won unanimous approval to build the complex on a 24-acre site between Lakefield Drive and Technology Circle. That was after residents from two nearby subdivisions flooded City Council members with emails opposing the request. (a) The city council shall create by ordinance such boards, commissions, and authorities to fulfill any investigative, quasi-judicial, or quasi-legislative function the city council deems necessary and shall by ordinance establish the composition, period of existence, duties, and powers thereof. (b) All members of boards, commissions, and authorities of the city shall be appointed by the mayor and council for such terms of office and in such manner as shall be provided by ordinance, except where other appointing authority, terms of office, or manner of appointment is prescribed by this charter or by law. (c) The city council by ordinance may provide for the compensation and reimbursement for actual and necessary expenses of the members of any board, commission, or authority. The Yes-side really does not want you to read the charter. The pretty postcards present the story as they want you to believe it. The Voter That Knows Votes NO! Please read the Charter and vote on November 8th. Is My Neighborhood in the Proposed City? The proposed city encompasses all the neighborhoods that are members of the United Peachtree Corners Civic Association and vast area beyond that. Those areas have had little or no communication that they are about to be ensnared by this new city. Mechanicsville, Lynwood Forest, area of Winters Chapel are all going to be gobbled up to support the new city and the UPCCA elites who wish to control their destiny. Please review the city MAP and check your address. If you are in, read the Charter and know what you are going to pay for. Then Vote on November 8! 1) Your Taxes will definitely be higher. Based on the feasibility study, that we are now supposed to ignore, the average homeowner in Peachtree Corners will pay several hundred dollars in additional taxes and fees for goods and services we already pay for and receive from the county. 2) Your Trash Hauler's rate from the city likely wont be any less than you are paying now, since the YES side anounced they have no idea if they can get it cheaper or not. 3) No one can Annex your property unless you have 2 agreeing parties. This is Georgia Law. If Norcross wanted to annex Peachtree Corners, they would have done it back in the 80'-90's when this area's technology boom was happening. 4) Code enforcement will be outsourced to a company that compensates their employees on a commission basis. If modeled after the other surrounding cities, it will be a primary source of revenue for the new city, and a nightmare to all residents. Ask some friends in John's Creek and Berkeley Lake. 5) Property values will still be based on economic conditions. Until the economy improves we will not see a change. 6) No one on the Peachtree Corners Ballot Committee stands to gain anything financial, The other side cannot say that. The proposed salaries have already gone up and we haven't even gone to the polls yet. What will happen if they are elected? 7) The Charter allows the new city to impose additional taxes, assesments, and other fees, without going to a vote to the taxpayers. It's all in the Charter and feasibility study (that they want you to ignore). 8) Our community leaders definition of "self determination" is for their own self, not yours. As Thomas Jefferson warned, "It is the nature of government to grow." Before the election, they talk of "self determination" after the election it will be "selfish determination". 9) Voting "NO" is not only an option, it's a right. It's your choice, it's your right. Exercise your right. Self-Determination - What Does it Mean in Peachtree Corners? Over the last few months the Peachtree Corners YES committee has held numerous town hall meetings in an attempt to sell the residents of PC on the idea of a city. As the public became more informed on the topic, resistance to the idea increased and many of the ‘selling points’ were discredited. Even Mike Mason admitted at an UPCCA meeting Monday night (10/24) that we shouldn’t pay any attention to the feasibility study, he doesn’t know if we can save any money on trash or not and said that if you read the charter you will need a lawyer because it is hard to understand due to all the legalese. “Sorta” sounds like the Peachtree Corners version of ‘we have to pass the bill to find out what’s in it’, doesn’t it? So, Mason said, they have now come down to one issue: self-determination. 2. Determination by the people of a territorial unit of their own future political status. Sounds like a great idea! Who can argue with that? After all, in the 1770’s the colonists wanted self-determination and to be out from under King George’s thumb. On TV the other night, Wayne Knox repeated the party line, saying that “the people who live in Peachtree Corners deserve the right to determine their own future and not have that future determined by politicians that we do not elect.” I don’t know what part of Peachtree Corners Mr. Knox lives in, but in my part we get to vote for a county commissioner and a commission chairman, as well as judges, PSC commissioners, school board members, sheriff, a district attorney and others who have a direct and indirect influence over our lives every day. The essence of their argument is that we in PC only get to vote for one commissioner out of 4 serving a county of 800,000 people and thus are subject to the whims of the other three. By their logic, perhaps we should consider becoming our own state- after all we only get to elect one state representative out of 180 and one state senator out of 54 representing a population of almost 9.7 million Georgians. The reality is that if the new city does only the three services the Charter and YES organizers promise (zoning, code enforcement and trash), then those are the only areas where PC would have anything resembling self-determination. A trash plan mandated by the city and charged on your property taxes is the same thing we already have. Code enforcement contracted out to a for-profit company that works on commissions is arguably worse than what we already have. That leaves zoning and most of the property in Peachtree Corners is already developed according to existing zoning. All the other services PC receives (fire, police, schools, parks, roads, libraries, etc.). will continue to be provided by the county, and we will still only have that dreaded one voice of 4 for 800,000 people on those issues. Does all this sound like enough self-determination to warrant higher taxes and fees on you and your family and taking the other downside risks of another government body? In discussing the pros and cons of Peachtree Corners becoming a city, residents have given many reasons for and against becoming an incorporated city. But how many of these are not valid reasons for becoming a city? Myth #1. “We will have more police protection.” - Not true. Fire and police protection will remain the responsibility of Gwinnett County, as they always have. Unless residents vote later to take responsibility for police protection, and vote themselves taxes 5 to 6 or more times the projected city rate of 1.0 mills, this will not change. Myth #2. “We can have Peachtree Corners as a mailing address.”- If you live in 30092, you can do that now. In fact the post office is in Peachtree Corners, Georgia,. Myth 3. “I will vote for it because of the schools and the kids.” - Becoming a city has nothing to do with schools or children. Gwinnett County will continue to provide public education, as they do in every city except Buford which has always had its own school system. Myth #4. “More sidewalks.” - Not true. Roads and sidewalks will continue to be handled by Gwinnett County. Myth #5. “It will keep the taxes down.” - Not true. Taxes will be raised not only for property taxes, but ad valorem on cars as well, plus franchise fees and a 2% tax on power bills, which we do not have now. Myth #6. “It will keep out development and businesses we don’t want.” - This is nebulous and debatable. Zoning in place cannot change and current county zoning is totally adequate. Myth #7.“It will raise our home values.” - Pure speculation. The economy, the home itself and location determine home prices. Myth #8. “Voting No is no option. - Of course it is. Myth #9. “Peachtree Corners will disappear if we are not a city.” - Of course not. Myth #10. “Vacant buildings will fill up.” - Really. How would this happen? Myth #11. “We will be annexed into Norcross.” - Not unless a majority of residents vote to do this. Fact #1. “Taxes will go up.” - VoteYes supporters admit this. City taxes are zero now and can be raised. The tax on power bills is zero now - it will go to 2%. Franchise and business license fees can and will be raised. Ad valorem taxes on vehicles will be raised. Fact #2. “Another layer of government will be added.” - What is another layer of government if not a mayor, city council and dozens of city employees. Fact # 3. “We don’t need a city.” - We don’t need a city because Gwinnett County performs all the services the new city would perform, with no increase in taxes. Become an informed voter. Read the facts, and ignore the myths. What this really means is that you aren’t just voting on the innocuous-sounding idea of a “limited-services” city; you are voting on the charter, a document which lays the groundwork for the formation of a full-fledged taxing, spending and regulating city. All of these "services" and "powers" require employees, offices, computers, networks, switchboards, transportation, maintenance equipment, maintenance employees, code enforcement officers, judges, prosecutors, benefits, human resources, payroll, accounting, collections, contracts managers, etc. etc. etc. Ask yourself how long one mil will pay the bills on all this? How much debt will the new city incur in start up costs alone? How long will a mayor of the largest city in Gwinnett with all this responsibility work for $9,000 a year? YES SIDE: Peachtree Corners is a unique community, a great place to live, work, and play. While some expect the success of the past to continue, many of your neighbors recognize that they must act now to assure the community remains a great place to live. That means becoming a city. Why do we need to become a city? Self‐determination. Shouldn’t we make the decisions that impact our property values and quality of life, just like the citizens of Berkeley Lake, Duluth and Norcross? No one could argue that those cities do not take actions to improve the property values of their citizens. Annexation attempts by those Cities will not stop because of the tax revenue available from the higher property values in Peachtree Corners. If annexation attempts are successful, we will lose zoning control of those areas and our property values will be affected. Some areas of our 40 year old community need revitalization. Who should we trust with that effort: the County, the surrounding cities, or the citizens of this community? By becoming a city, we will have the legal boundaries needed to stop annexation and the legal basis to determine our own future. NO SIDE: We agree that we have a beautiful and vibrant community, but our community is our neighborhood and its surrounding area. The proposed city encompasses Mechanicsville and parts of Doraville. Its boundaries extend from Buford Hwy to the River and to Winters Chapel Rd. Counting our community in the proposed new city will certainly help the property values of some of these places. If we are really looking for a more prestigious and potentially property-value enhancing label, lobbying to become part of Berkeley Lake would serve us better than a new Peachtree Corners moniker. (The dam is now fully funded by FEMA and not a burden to the tax payers there). Are we in danger of being annexed? No. Under GA code, there are 5 ways that a community might be annexed by a nearby municipality. The first 4 require a vote by the residents to be annexed. The last is the only way lands can be annexed without a vote by the residents. But it only applies to areas of unincorporated land completely surrounded by an existing municipality and thus it does not apply to us. YES SIDE: What services will our City provide? The three services the City will provide are planning and zoning, code enforcement and solid waste disposal. These are the key quality of life services that allow us to most economically influence our property values. All other government services will be provided by Gwinnett County, as they are today. This concept of a limited service city leverages Gwinnett County for services requiring economies of scale and allows the community to provide services that are best done locally. As a result, the overall cost of government is lower and assures the lowest total tax bill to the citizens. NO SIDE: What about those great services? The proposed city does have a limited number of services it will offer to start. But the charter allows for easy growth beyond that. It discusses buying buildings and land, creating parks, hiring personnel, and entering into contracts as the officers deem necessary. In fact the feasibility study anticipates the need to create a municipal court, hire a judge, and provide infrastructure to hear cases under the new city power of code enforcement. The study states that most municipal courts derive only 2-4% of revenues from code enforcement fines so to cover operating cost of the court additional jurisdiction would need to be granted. Ask yourself a simple question about our community—Are there massive problems with the maintenance or aesthetics of property that can only be solved through a new city bureaucracy and guys writing tickets or making arrests? YES SIDE: What does it cost? We will have an increase in property taxes of up to 1 mil (.001) on the assessed value of all real property. For example, a $300,000 home would have a tax of $120 per year, or $10 per month. Our maximum 1 mil rate compares favorably to Berkeley Lake, 5.386; Duluth, 5.992; and Norcross, 6.424. Solid waste disposal would provide a significant savings. All Gwinnett citizens pay $18 per month for trash pickup. Most citizens pay an additional $10 per month for yard waste, for a total of $28 per month. An estimate from a current trash hauler for comparable service was $15‐$16 per month, representing a $144 per year savings. There would also be a small increase in franchise fees on our electric, phone, cable, and gas bills. We already pay certain franchise fees, and those will now go to the City, instead of to the other entities. 1. Business taxes and fees support residential services. If not enough businesses stay in PC, the City will likely borrow to make ends meet and then call for a tax increase vote. 2. The charter authorizes PC City to add-on to ad valorem tax for vehicles, boats, trailers, motorcycles, etc. 3. Franchise fees on utilities can and will be increased. 4. These increased costs to local businesses would be passed along in the form of higher prices to us. 5. There is no new garbage plan contract guaranteeing a lower price. There is a hope it can become cheaper. 6. Once the City incorporates, it must negotiate a Service Delivery Strategy (SDS) with the County. There is no County tax relief for Redundant services. The charter gives the city council the rights to set fees, assessments, and to issue debt bonds. It reserves the right to spend money with impunity and we have seen what happens when a government can spend at will without the means to fund it—big debt. The city will need buildings, IT infrastructure, employees, employee benefits including retirement, legal council and more to operate. We already bought these things once for the County. Why buy them again for a city? YES SIDE: Why isn’t “doing nothing” an option? Ignoring the challenges that we face by “doing nothing” will leave us vulnerable to the actions and decisions of others. Historically, we have assumed our County Commissioner would always be an advocate for Peachtree Corners. But they are only 1 vote out of 5 on a County Commission increasingly focused on a shrinking budget. And, they may not always be from Peachtree Corners. Our volunteer effort, the United Peachtree Corners Civic Association, cannot sustain the effort to raise private funds for community beautification, create a community master plan for revitalization, and fend off annexation attempts. If we do nothing, we lose this unique opportunity to determine our own future. NO SIDE: Beware of those diabolic “others”? The Yes-folk declare we cannot “do nothing” and leave our fate to the County as we have historically done. Presumably that is because those politicians are more diabolical and out-to-get us than any politicians that might use offices closer might be. The notion that the United Peachtree Corners Civic Association needs/wants money is not a reason to build a city, for certain. Vote NO on a city. It’s a sure thing. A yes vote is just a hope that by some miracle this new government will be better than any other we deal with on a regular basis. All of these taxes, fees, licenses, and charges are ways for the new city to fund any shortfalls that a low one mil property tax does not fund. Business owners can expect to pay higher fees and be nickel-n-dimed to death by “enforcers” out to fill the city coffer. We have already seen several businesses petition Norcross for annexation to avoid coming under a new city hostile to business. If There is a City, Will My Home Value Increase? In today's economic environment this statement holds no water. Your values are going to be based on what someone is willing to pay for your home. It's all a matter of supply and demand. One other thing to mention is location. In real estate we use the terminology location, location, location. In some instances, having a home inside the city limits will be a deterrent. I look to my friends who live in John's Creek, who are now wishing they were still unincorporated Fulton County. The vote is on November the 8th. 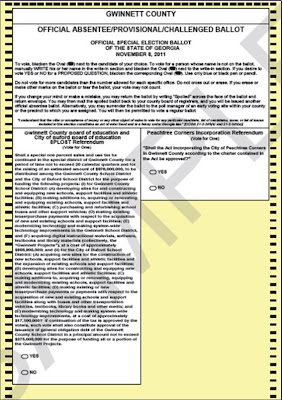 The other item on the ballot the SPLOST (Special Purpose Local Option Sales Tax) It is a one cent sales tax that goes directly to the schools. Invest in good schools. Good schools will support your home values. How Easy is it for the New City to Raise Taxes? The Yes-folk point to the charter provision that requires a referendum in order to increase property taxes or add services not already reserved in the charter. But, it is all too easy to put issues on a ballot in an “off-year” election year and have them pass with very few votes. For example, earlier this year Charlotte Nash was elected to the Gwinnett County Commission to complete the term vacated by the disgraced Charles Bannister. It was an "off-year" election. There are 155 precincts in Gwinnett County. Historically, the precinct with the highest turnout has been the one at Peachtree Corners Baptist Church. Charlotte Nash won 51% of the vote at that precinct, and she only had 74 votes. I'll type it again in case you thought it was a typo- 74 votes. The other three challengers on the ballot had 72 votes between them. Of 2000 voters registered to that precinct, only 151 (less than 8%) turned out to vote. If Peachtree Corners becomes a city, there will be an estimated 21,000 voters in PC. If there is an off-year election to add services and/ or raise taxes, and only 8% of the voters turnout, all it would take is for 850 people to vote yes, and the rest of us would be paying higher taxes. When I bring this up, the Yes-folk scold me for lacking faith in my neighbors. I love you guys, but I know how busy our lives are. It is easy to miss these off-year votes. This is especially true when the government desiring the tax increase can fund the spin on information and a get-out-the-supporter-vote effort. Any opposition will have to be quickly organized and would have no funds to support it.